When I was a little girl, summers seemed longer and hotter. Perhaps it was because I grew up in an era when window fans were scarce and air conditioning was practically unheard of. 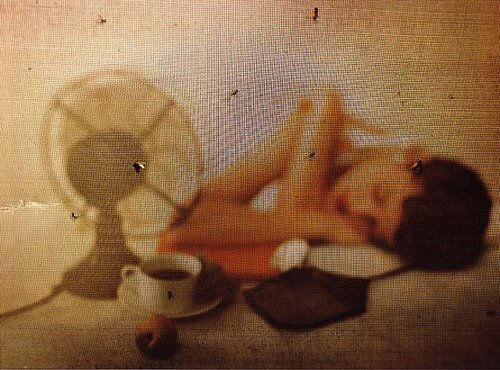 On scorching summer days, my mother pulled the window shades to keep the house as cool and dark as possible, and when night fell, she put a small table top fan in my bedroom. Its metal blades reminded me of airplane propellers and it hummed a hypnotic tune that lulled me to sleep on hot August nights. I knew fans were dangerous, as my parents had warned me that the spinning blades could sever a small child’s fingers, leaving her without a finger to wear a diamond ring. Still, I was intrigued, and more than once, cautiously poked the tip of my index finger just inside the metal grid as the blades slowed to a stop. Fortunately for me, my finger was not long enough to reach the blades, but the thrill of taking the chance created chills along my spine, which cooled me more than the fan’s breezes. Most of the shops in the middle of my home town had huge oscillating fans that stood on the floor and swept gentle breezes across the merchandise in lazy back and forth patterns. There was a fresh produce store in the center of town and upon entering on hot Saturday mornings, I would inhale the pungent aroma of peaches and plums as my mother waved away fruit flies and piled grapes on a squeaking scale. The meat market was similar, as was the bakery and the five-and-dime. Some of the fans had small ribbons attached to the grids that fluttered in the breeze. I watched them with delight until my mother took her change and handed me the paper bag. We walked from one store to the next, ducking under striped awnings to avoid the blazing sun, watching a haircut through the windows of Smitty’s barbershop, peering at dresses and hats on the mannequin in Nikki’s Shoppe, and as a rare treat, licking an ice cream cone from the soda fountain at Galas’ Drugstore. The library was a mile walk from our house, and my siblings and I frequently trudged down Green Street and up Academy Hill to spend an afternoon within its cool granite walls. Half way up the hill we would pause to look over the bridge that spanned the railroad tracks. Along the edge of the tracks was a small spring that trickled water down the granite ledge and into the ferns and moss below. Out of reach, it taunted our parched throats and dry tongues, and we yearned for just one swallow of its coolness. After a short rest, we continued our trek until at last we reached the marble sink just inside the library entrance. Standing on tiptoe, we guzzled water from the faucet and then spend hours browsing the aisles to choose an armful of books to carry home. On rare and wonderful occasions, Mary Reed Newland presented story hours on the library lawn. She was a wonderful artist and author, with a love for children and a flair for dramatic story-telling. We children gathered on the emerald grass to listen to her spin tales of adventure and fantasy. She filled our heads filled with dreams and images while our sweaty bodies cooled in the shade of the maple trees. The dog days of summer seemed endless, and so were our tactics to keep cool. We swam in Wally Lunden’s pond. We ran through rainbows created by the running garden hose and danced in the summer showers when the yellow skies turned gray and big drops splashed down on the parched pavement of the driveway. We slurped slushy popsicles that dripped sticky and purple down our arms. We scratched tic-tac-toe in the dark soil beneath the shade of the catalpa tree in the side yard. And at night, we rested our pillows on the window sill and read by the street lamp while soft breezes lifted the shades and slapped them against the screens. These days I go from an air conditioned apartment to an air conditioned car to an air conditioned office. And although I enjoy the cool dry air that the technology and Freon afford me, summer no longer is lazy and relaxed like when I was a kid. I can’t help but wonder if our cool comfort has robbed us of the excuse to sit on the front porch with glass of lemonade, or to snooze in a hammock for an hour, or to stay up late and watch the heat lightening streak across the sky. Gone is the slow, easy pace that came with the heat of summer. I accomplish more these days. I sleep in silent comfort with the windows closed and the central air running. But sometimes – just for a moment- I long for blistering days when the cicadas sang to the sun god, and I took the time to notice that the baking heat was lifted for just a moment by the lilt of a breeze or the hum of a fan. Today I have a heavy heart. Yesterday, while hundreds of people in Kampala, Uganda, gathered to watch the World Cup, there was a bombing. One American was killed. He was Nate Henn. 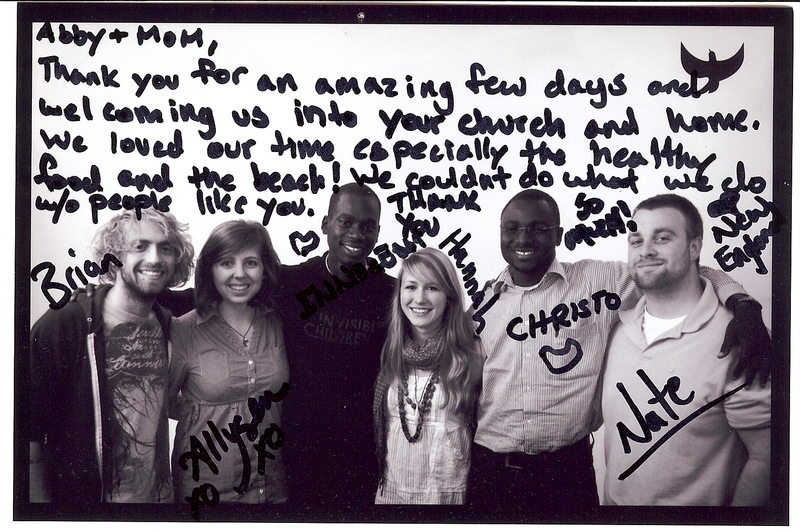 I met Nate when six young people from Invisible Children stayed with us this past winter. My daughter Abby, had arranged for them to speak in our area of New Hampshire and although many people with much grander homes offered to host them, they chose to stay with us. The group arrived after church on a Sunday, blurry eyed and travel weary, piling their backpacks and sleeping bags into the living room. They warmly introduced themselves; Brian, Hannah, Allyson, Christo, Innocent and Nate. I learned that Christo and Innocent were native Ugandans. Hannah, one of the roadies, was from the UK. The rest, roadies as well, were Americans. After a bit of small talk, they put a movie into the DVD player and soon were asleep, snuggled up to each other like six little puppies. While they napped, I cooked and made a pot of coffee. Nate was the first to awaken, and gratefully accepted a cup of coffee. He was obviously the Papa Bear of the family, waking the others shortly before it was time to leave for their next speaking engagement. He expressed concern for Christo, who was not feeling well, and his worried eyes relaxed when I told him I would take care of Christo while the rest of them were away. That evening, after ibuprofen and tea, Christo and I chatted. In the few hours of that Sunday evening, I learned more about Uganda than I had in my entire life. Christo, an engineer, designs and builds schools. His brown eyes glistened as he told me of his passion for education. It is his belief that the future of his country rests on the shoulders of people like Innocent, who was kidnapped at age seven by the rebel army and forced to serve as a soldier. Innocent escaped and was captured, and beaten so badly he was unable to walk for days. Told that if he tried to escape again, he would be shot as an example to the others, he waited until he was well, and again escaped, this time successfully. 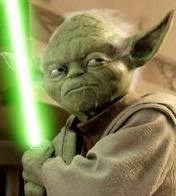 He and the other Invisible Children, spent their childhood in hiding, in order to avoid the rebel forces. Now grown and ready for college, Innocent’s dreams are to finish his education and return to his homeland as a leader who might restore it to a country where children don’t die from cholera, AIDS and rebel gunfire. The rest of the week was filled with the comings and goings of the Invisible Children’s ragtag army. Every day, they spoke in schools and churches to raise awareness and funds, and then tired and hungry, they returned to our apartment to eat, sleep, and catch up on their email. My living room was a sea of bedding, laptops and clothing, and for a week, I was their mother- cajoling them into eating more vegetables, picking up their empty glasses and joining in their banter. For their farewell dinner, I made lentil soup. Nate, filling his bowl a second time, pronounced it was the best he’d ever had. Nothing warms the heart of a mother, surrogate or otherwise, more than filling the bellies of her loved ones. The next morning, there were hugs all around and then they were gone. All that was left were deflated air mattresses and a signed post card on the kitchen counter. The place they had carved in my heart ached with emptiness. So this morning, when I saw Nate’s picture on the TV screen and heard how he and sixty four others were killed by suicide bombers, my heart broke a bit. The monster that Nate battled- the repugnant monster of strife and war and killing- ultimately took his life. You might think this is the end of the story, but we can make it a beginning. Because of who Nate was, and who the others who share his vision are, the work will continue. If half the people who heard Nate’s voice pick up where he left off, his song will continue. We can sing another verse. We must sing another verse. So Nate and his comrades in the war against hate will not have died in vain. Today I’ll mourn but tomorrow, I’ll be in the alto section. How about you? There’s a song that Peter, Paul and Mary used to sing called The House Song. The lyrics trace the singer’s steps through the rooms of a house, paralleling it to the stages of one’s life. This week, as I’ve watched my son pack his entire life into a white Hyundai Accent, the strains of that song have filled my head, stinging my eyes and creating a lump that catches my throat when I try to speak. Over the years, I have lived in many houses, each with memory filled rooms. The house on Green Street where I grew up was an old New Englander, with walls made of plaster and horse hair held together by layers of wallpaper patched with cardboard and masking tape. It was bursting with the energy of eight children, two adults, one dog, four cats, two rabbits, and a turtle purchased from the Five and Dime. The rugs were threadbare and the furniture falling apart, but it was easily the most popular hang out in the neighborhood. There was always food to feed one more mouth. There was always coffee to refill one more cup. There was always time to sit at the kitchen table and chat with someone who needed a kind heart and a willing ear. It was home. When I joined VISTA and moved to Idaho, I rented a room in an older section of Boise. My room was furnished and just big enough for a twin bed and dresser. The walls were painted a garish pink and the en suite bath was tiny, but it held all my worldly belongings and served me perfectly until I moved to the second floor flat that served as a honeymoon suite for my new husband and me. The next several years were a flurry of moves from one apartment to another. A two bedroom in Flagstaff Arizona was spacious and bright, but after three months we packed everything we owned into the back of a station wagon and drove to Massachusetts so I could be closer to my family. With each new home came an accumulation of hand-me-down furniture, and one room at a time, we built ourselves a life as a family. We bought a tiny doll house at the end of a cul-de-sac for less than thirty thousand dollars. One September evening, queasy with pregnancy, I straddled the roof peak during a rainstorm and held a flashlight so my husband could nail the final shingles into place. The following May I brought a tiny pink bundle home to the freshly painted second bedroom and the two of us became three. Within a year, we sold the little house and moved to New Hampshire. We added a blue bundle and another pink to our family, and finally settled in a three bedroom townhouse that smelled of wet paint and new carpeting. Peach comforters and curtains for the girls’ room washed the white walls with the color of sunset at the end of the day. Pound Puppies kept my little boy company on sleepless nights and provided a refuge from Barbie dolls and tea parties. Countless bedtime vespers were said in those rooms, countless tears dried, countless adventure stories read, countless goodnight kisses planted on rose petal cheeks. When fifteen years later, a broken marriage forced us to leave, I sat in the empty rooms and listened to the ghosts of my children past. Divorce is never easy. I wear it like Hester Prynne’s scarlet letter. It is a reminder of failure, of what was, of what will never again be. On moving day, I returned alone to the empty townhouse. The bedroom we shared was the last space to check. 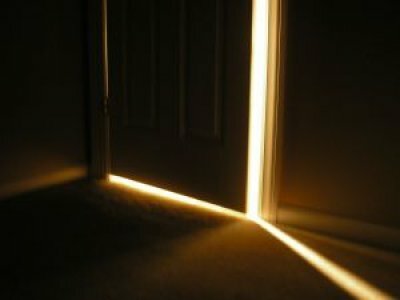 I silently stared at the indentations in the carpet where our bed used to be, and then quietly walked down the stairs and out the door, locking it behind me. Now I live in a two bedroom apartment with white walls and beige carpets. The children are adults. They come, they stay, they go. It is the way of life. I complain about the mess when they are home. I complain about the quiet when they are away. Gone are the stuffed animals, the bikes thrown carelessly across the sidewalk, and the tiny toothbrushes that used to mysteriously fall into the bathroom drain. But this is a new house. It is a place where there is always food to feed one more mouth. A place where there is always coffee to refill one more cup. A place where there is time to sit at the kitchen table and chat with someone who needed a kind heart and a willing ear. It is home.